Being one of the leading names in providing excellent quality products, we are offering Puffing Machine. Apt for all types of grains, puffed rice, rice flakes and health mix products with operating fuel as gas, diesel, kerosene and firewood, these machines are of world standard. Some of their attributes are durability, toughness, tensile strength and high performance. Fabricated using high quality raw materials and following all international specifications, these machines come with roasting temperature controller. Made from latest technology our industrial machines can withstand all kinds of quality testing. Our experience in industrial products, helps us in manufacturing best quality Puffing Machine. 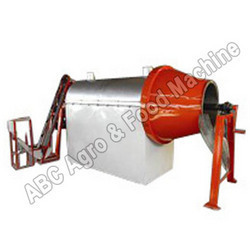 Made from finest of raw materials, the variety in these machines are numerous. Use of high technology and latest methods, makes these on of the most widely used puffing machines. A stringent quality tests and incomparable finish gives these machines there high performance and durability. Suitable for all kinds of food processing industries, which are concerned in being cost effective along with best of quality.